John Berggruen Gallery is pleased to present an exhibition of new paintings by Stephen Hannock. New Work will be on view from November 5-December 5, 2009. John Berggruen Gallery will host a reception for the artist on Thursday, November 5 between 5:30 and 7:30 p.m. The opening reception will also include a signing of the artist's recently published monograph from Hudson Hills Press; a 30 year survey of work including the just completed painting, Northern City Renaissance, the culmination of a six year project with the musician Sting. New Work is a series of nocturnes that examine the unusual atmospheres that occur in the Napa Valley, often observed by locals and visitors alike, but rarely recorded; a familiar bucolic setting rendered brooding and dramatic as day turns to night, and night yields to dawn. The centerpiece of the show, Recent Adventures with Art in the Napa Valley (Mass MoCA #117), is a large (72 x 109 inches) view of the Napa Valley at dawn from an aerial perspective. Also on view are several small works created in conjunction with Recent Adventures which evoke the tradition of low-light studies by artists such as Whistler and Remington, and relate thematically to Recent Adventures. Two of the smaller nocturnes are from farther afield, inspired by the topography of the Chianti region. The title of the central work hints at the artistic journey that Hannock went through in the creation of the painting, as well as referencing the Western Massachusetts studio in which it was created. Originally conceived of as a history of the Napa wine industry, the painting rapidly evolved to reflect the 'art adventures' that unfolded during Hannock's preliminary research. The final painting, along with the smaller works, speaks not only to the history of landscape painting in American and British art, with hints of Turner and Ryder along with Whistler and Remington, but also to the process of artistic and personal discovery that unfolds along with each of Hannock's masterpieces. As in much of Hannock's previous work, layers of texts and images form the backbone of Recent Adventures, shaping the composition and producing a final product that is, literally and metaphorically, multi-layered. The hand-written texts evolve along with Hannock's preliminary work on the painting, and are laid in much like a preliminary drawing. As Hannock works, the texts help to shape the final composition, even as they are partially obscured by layers of paint. The final result encourages the viewer to look closely, peering below the surface in an attempt, ultimately frustrated by the partial nature of the texts, to read the written narrative. Hannock's surfaces are a hallmark of the artist's work, machine polished layers of paste and resin, text and paint. 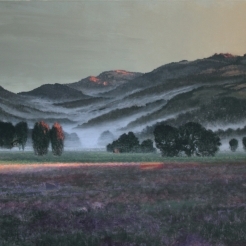 Although Hannock's work naturally draws comparisons to the nineteenth-century tradition of landscape painting in America, specifically the Hudson River School and the so-called Luminists, he is an artist completely at home in the twenty-first century, creating elaborate web features on his large-scale works and engaging with digital media. The freedom with which Hannock works, progressing rhythmically from text to paint, layering images and words, and constantly evolving his subject matter is a world away from the comparatively more rigid working process of his artistic predecessors, yet Hannock's largest series to date, the Oxbow paintings, pays homage to past masters of American art. The Oxbow: After Church, After Cole, Flooded (Flooded River for the Matriarchs E. & A. Mongan), Green Light (2000) is one of two works by Hannock currently hanging in the Metropolitan Museum of Art in New York, a signal honor for a living artist. In addition to the Metropolitan Museum of Art, Hannock's work is included in numerous significant public and private collections, such as the National Gallery of Art, Museum of Fine Arts, Boston, Smithsonian American Art Museum, Museum of Fine Arts, Houston, Texas, Museum of Contemporary Art, San Diego, Williams College Museum of Art, Williamstown, Massachusetts, Albany Institute of History of Art, Albany, New York, and Grand Rapids Art Museum, Grand Rapids, Michigan. Born in Albany, Stephen Hannock lives and works in New York and Williamstown, MA.